Please note: if you have previously bought Relic Grey Limestone from us, we are now sourcing from a new quarry so this new batch will be much greyer than previous batches. For more information, please speak to a member of our sales team. This hard-wearing limestone has pleasing fossil and quartzite details, reminiscent of fine handmade paper. An aged finish with fine pitting and tumbled edges make for a rustic yet subtly finished stone, with warm grey and copper tones and rust and white coloured quartz detail throughout. Relic Limestone has a beautiful rich patternation with dark fibrous fossil detail giving the appearance of handmade paper. This stone is coloured light to dark grey with warm brown and copper undertones and occasional rusty orange and white flecks of quartz. 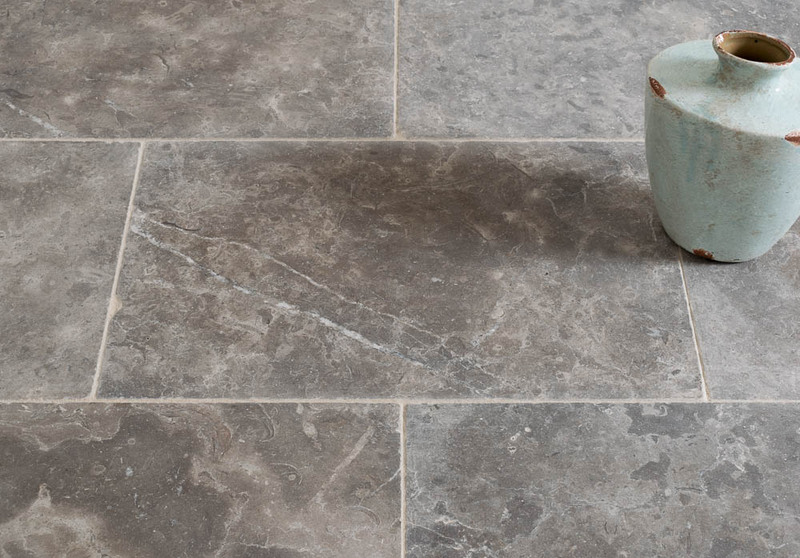 Tumbled edges and surface give a rustic finish to this limestone which is available in a popular 600x400 size for dramatic effect and can be used throughout your home and outside. Our selection of limestone tiles offer a large variety of colours, sizes and finishes. Customers often perceive limestone to be a pale, chalky colour but in reality, there is something to suit most interiors. Our limestone range is available in a range of formats with large flagstones proving hugely popular for those seeking a traditional flagstone floor which looks centuries old, to large square tiles for those seeking an ultra-modern, contemporary look with minimal grout lines. Limestone is a sedimentary rock which has been formed over many years and it often contains beautifully preserved fossils, mottling and natural variation.